The Washington Road Elms Preservation Trust is a 501(c)(3) non-profit foundation dedicated to the preservation and maintenance of the historic elm-lined allée along Washington Road in West Windsor Township, NJ. Tax-exempt donations are accepted to further the mission of the trust. The Washington Road Elm Allée is a 0.7 mile-long roadway bordered on both sides by 76 elm trees that were planted ca.1925 on 50-foot centers directly across from one another. The trees create a majestic vehicular entrance to Princeton University and the Township and Borough of Princeton. The Washington Road Elm allée is the most extensive surviving elm-lined roadway in central New Jersey and the only one that serves as a scenic vehicular entrance to a town. These elms also have horticultural significance. Bred for hardiness they turned out to be resistant to Dutch elm disease, which hit the United States in 1930 and killed over one hundred million trees nationwide, including the vast majority of elm allées that once characterized the streets and open roads of many American towns and cities. 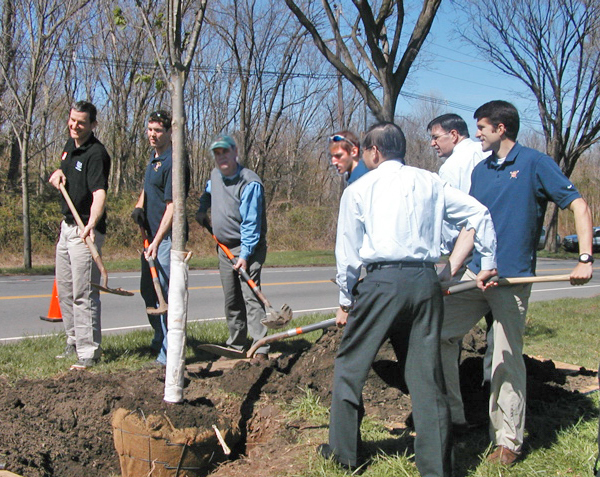 In observance of Arbor Day and Earth Day, representatives from Princeton University, the Washington Road Elms Preservation Trust, Princeton University's fencing team, the U.S. Senior National Men's Rowing Team, West Windsor Shade Tree Commission and Riveredge Farms of Atlanta, GA, gathered to assist in planting 10 Princeton elms (Ulmus americana) along Washington Road (Mercer County Road 571). Also present were West Windsor Township Mayor, Shing-Fu Hsueh and Mercer County Executive, Brian Hughes. Roger Holloway, who grows Princeton Elms at his Atlanta nursery , Riveredge Farms, said replanting trees such as the Princeton Elm has more than just a sentimental benefit, however. "It's very important, especially considering all the foreign diseases coming in affecting trees," he said, mentioning Sudden Oak Death disease, Bacterial Leaf Scorch, the Asian Longhorn Beetle, and the Emerald Ash Borer as all having contributed to the demise of millions of trees. This is why, Mr. Holloway said, resistant strains of trees need to be identified and propagated. Riveredge Farms donated the trees that were planted last week. He also noted that some Home Depot stores are now stocking the Princeton Elms, specifically the store in Hamilton/Robbinsville.